Call me curious, but among all of the blog-o-sphere 'what's in my bag'-posts are probably my favorite type of posts. There is something about knowing what your favorite internet people are carrying around every single day, to see what their must-have items are and maybe find out that you have some things in common. But when I thought about it I realized that because of my love of bags I hardly ever wear the same bag more than a couple days in a row. My choice of handbag depends on where I'm going that day, what I need to carry with me and whether or not it matches my outfit (although with my predominantly black and white wardrobe that never really poses a problem). I thought it would be better to show you my handbag staples. The items that move from bag to bag, whether it's a clutch on a night out or my massive Zara laptop bag. These are my every day staples. Pink phone case/wallet - this feminine pink wallet also has a spot that holds and protects my phone. This has my paper money in and my most used cards. iPhone 5S/headphones - I use an iPhone and even with the massive leaking of celebrity nudes, the new phones bending when you put them in your pocket and the general overprized nature of the brand, I still love it, The OS is super easy to manage and all the awesome apps come out for iPhone. Plus the camera on this thing is amazing and lifestyle posts would not happen without this thing. I'm always listening to music when I'm travelling somewhere, so the iPhone headphones are an absolute must. Coin purse/card holder - my wallet doubles as a phone case and that causes it to lack in storage space for my cards and change. So my old H&M snakeskin purse now functions as extra storage holding the multitude of loyalty cards and stamp cards for my near daily coffee runs. Clarins Beauty Flash Balm - the ultimate quick fix for tired lackluster skins. It hydrates instantly and it smells divine. I seriously believe everybody should own this. Clarins Instant Light Natural Lip Perfector - a lipgloss that feels like a balm, leaves a gorgeous light color on your lips with a beautiful sheen. No glitter to be found, anywhere. RMS Beauty Living Luminzer - this stuff is the product of angels, I am sure of it. The incredibly gorgeous shine this provides is enough to lift any complexion. I pat this on my face wherever I need it during the day. But most in the inner corners of my eyes, my cheekbones and my cupid's bow. I don't want to live in a world without this gorgeous stuff. Chanel Les Beiges powder - the powder that is normally a little too dark for me but with my summer skin still lingering it's just the right thing to warm up my complexion. It gives a very perfecting view to the skin, almost as if it was airbrushed. I also love this because the compact comes with a fairly large mirror. And I feel very fancy whipping this out in public. Zara Roller-ball Perfume - it's small, it's easy to carry around and it smells divine. The Zara 11, Corse Vittoria Emanuele Milano (jeez, what a mouthful) is a lovely feminine scent. It's very sweet and flowery and just up my alley. And there they are, my handbag staples. Not too many yet there is quite the post dedicated to them. I'm curious, what do you like to carry around on a daily basis? Hi Kelly! 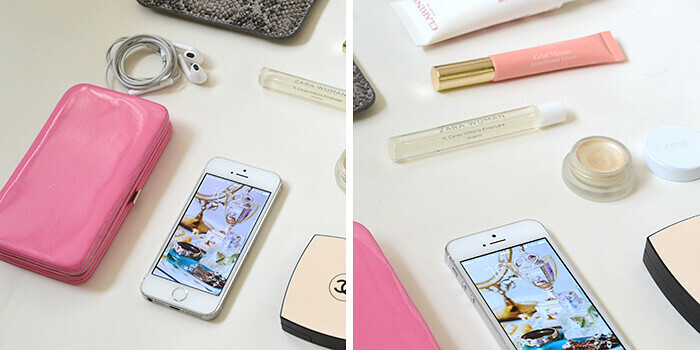 I do love a good 'what's in my handbag post'! Great post! Thanks, Stacey! Snooping in other people's bags is so fun, isn't it? I don't think anyone can live without the two! I've been on the hunt for a rollerball to keep in my bag and I had no idea that Zara have them! Thank you for sharing.